An impressive early map of the world. Die erst General Tafel / Die Beschreibung und den Circkel des gantzen Erdtrichs und Deeres innhaltend. 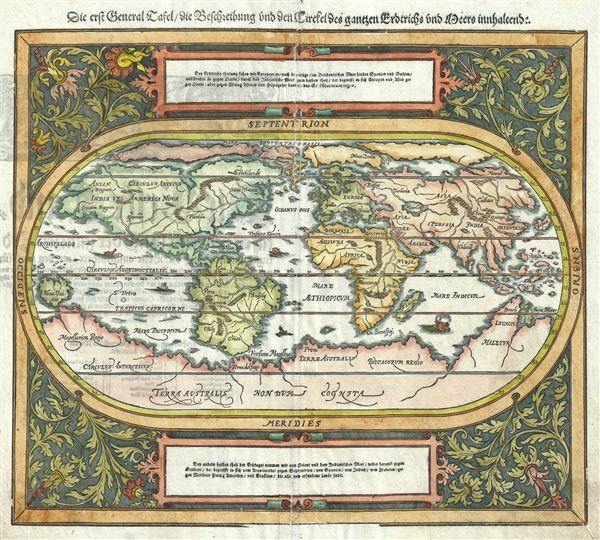 An attractive example of Sebastian Munster's 1588 map of the world. Munster presents us with an expansive view the world with a number of interested cartographic features. Along the bottom of the map the dramatic unknown southern continent (Terra Australis Nondum Congnita) stretches to include the discovered lands of Tierra de Fuego and what appears to be a proto-Australia. South America bears the characteristic western budge in the vicinity of Chile that appeared on many early maps. The cartographer also maps a impressive and seemingly navigable northwest and northeast passages. In North America Florida, had Nova Francia are identified as re they mythic kingdoms of Anian (from Polo) and Quivara. IN South America the Amazon River and the Rio de la Plata are clearly identifiable. Arica id drawn on th Ptolemaic model with the Nile terminating in two (I this case three) large lakes. The Niger, extending from the west, is separated from the Nile by an impressive mountain range. In Asia, Japan and the Chinese city of Quinsai are noted. The landmass that appears to represent some sort or Pre-discovery knowledge of Australia is an amalgam of a misconstrued Java and legends from the diaries of Marco Polo. The map is oval in form and surrounded by elaborate vine and leave engraving. German text appears above and below the map proper describing the lands contained. The verso contains German text describing the earth. The title appears over the map in German text of a Gothic ethic. This 1588 map was engraved in woodcut and published in Basel by Sebastian Petri. After 1588, this map was only re-published in posthumous German editions of Sebastian Munster's Cosmographia issued in 1592, 1598, 1614, and 1628, and is thus rare. Good. Some centerfold damage and repair. Shirley, Rodney W., The Mapping of the World: Early Printed World Maps 1472-1700, #163.